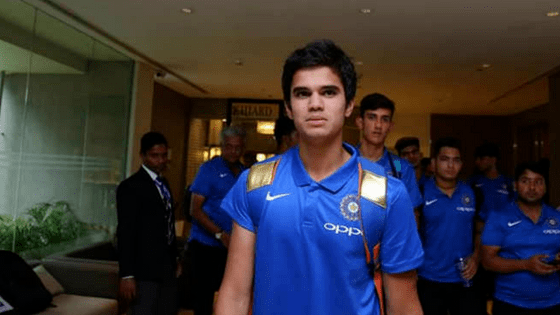 Arjun Tendulkar left-arm pacer claimed his maiden International wicket for India U-19 in the first test match against Sri Lanka at the Nondescripts Cricket Club Ground, Colombo. He took his first international wicket by trapping Sri Lanka’s Kamil Mishara in front of the wicket. Mishra who made his first-class debut at the age of 15. In this match, he has not got a quick start and had scored 11 of 9 balls before Arjun Tendulkar sends him back to the pavilion. Although, Sri Lanka has won the toss and elected to bat and Captain Anuj Rawat gave Arjun to bowl for the first over of the match. And Arjun did not disappoint his skipper and took a wicket on the last ball of his second over. Till the lunch session, he has bowled five overs and took 1 wicket by giving 18 runs. The son of Master blaster Sachin Tendulkar on his way now. This was the first international match for Arjun and fans will hope to make India proud in future. India is going to play two youth tests. Junior Tendulkar has been spotted in the domestic nets bowling to the LEGENDS. And hopefully, he is going to use his experience against Sri Lanka cricketers. Sanath Kumar the earlier Indian U-19 coach has said about junior Tendulkar that “ he will be like any other member of the team. Mr Kumar will guide the fresh batch of India U-19 and also Jr. Tendulkar as Paras is on duty to England. Well said to the coach Mr Kumar, how would you handle Arjun he said: “ I don’t know about that as it’s not my area of concern but as a coach, all the boys are equal to me”. “ For me, Arjun is no different from other kids. My job is to bring best out of each and every one of them”. When is getting selected for India U-19 team there was a criticism from certain people from certain quarters. But however Mr. Jr. Tendulkar proves it wrong, like his dad, The Master blaster Sachin Tendulkar has always done by performing on the field and managed to shut up the critics. After Arjun taking his maiden International wicket, the former Indian cricket and a childhood friend of Sachin Tendulkar Vinod Kambli couldn’t control his emotion and wrote his feeling on Twitter. Here is what he has written: “ Tears of Joy rolled down when I saw this, have seen him grown up and putting his hard work in his game. Could not be more happy for you Arjun. This is just a beginning, I wish you Tons and ton of success in the days to come. Cherish your first wicket and enjoy the moment”.